quell’orto chiuso? i rovi con le more? i ginepri tra cui zirlano i tordi? sarei passata al triste fiore accanto. that closed garden? The brambles with blackberries? The juniper in which the thrushes chirped? «Death. Yes, I do, darling». «And was it true? passed next to that sad flower, oh Rachel. 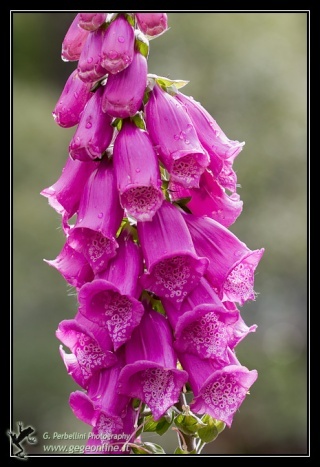 With these words Italian poet Giovanni Pascoli sang in his poetry “_La digitale purpurea_” about Digitalis Purpurea, commonly known as Foxglove. Digitalis is a genus which comprehends about twenty species of herbaceous plants native to western and southwestern Europe, western and central Asia, Australasia and northwestern Africa. Since ancient times, an extract from Digitalis was used as a remedy to heart failure; William Withering, an English physician and herbalist, was the first one who described effects of Digitalis in medical literature (1785). On the other hand, an overdose of Digitalis puprurea can cause intoxication. From Digitalis purpurea is extracted a group of medicines called Digitalin, which contain cardiac glycosides (*digoxin* and digitoxin). Digitalis compounds are potent inhibitors of ubiquitous cellular Na+/K+-ATPase, which moves sodium ions out of the cell and brings potassium ions into the cell; so the system mainteins the normal transmembrane potential necessary to normal cell functions (especially in nervous system). It is also an electrogenic pump, because it transports three sodium ions out of the cell for every two potassium ions that enter the cell, generating an electrochemical gradient. In cardiac myocytes there is a Na+-Ca++ exchanger that is essential for maintaining sodium and calcium homeostasis. Calcium and sodium can move in either direction across the sarcolemmatic membrane; the exchanger moves three sodium ions for each calcium, so it generates an electrogenic potential too. The membrane potential and the chemical gradient for the ions determine the direction of movement of these ions (either inward or outward). An increase in intracellular sodium concentration competes for calcium through this exchange mechanism leading to an increase in intracellular calcium concentration. When intracellular sodium increases, the concentration gradient driving sodium into the cell is reduced; so it is also reduced the activity of the exchanger, which decreases the movement of calcium out of the cell. Therefore, mechanisms that lead to an accumulation of intracellular sodium cause a subsequent accumulation of intracellular calcium because of decreased exchange pump activity. Because of their inhibition of Na+/K+-ATPase, cardiac glycosides cause an increase of intracellular sodium concentration, which leads to an accumulation of intracellular calcium through the Na-Ca++ exchange system+. The augmentation of intracellular calcium in cardiac myocytes brings to an increase of calcium release by the sarcoplasmatic reticulum; then more calcium is available to bind to troponin-C, which increases inotropy. Moreover, Na+/K+-ATPase shows a polarization: the phosphorylated enzyme releases energy only if K+ binds its binding-site on the outer side of the membrane. This site is also the target site for digoxin, which competes with K+ on the outer side of myocites: since digoxin inhibition is a competitive one, digoxin toxic effects are worsened by hypokalaemic conditions (i.e. a decrease of K+ concentration in extracellular fluids) and counteracted by hyperkalaemic conditions. Furthermore, inhibition of the Na+/K+-ATPase in vascular smooth muscle causes depolarization, which leads to smooth muscle contraction and vasoconstriction. Digitalis compounds also increase vagal efferent activity to the heart, but this mechanims is not fully known yet; however, this parasympathomimetic action of digitalis reduces sinoatrial firing rate (i.e. it has a negative chronotropic effect) and decreases conduction velocity of electrical impulses through the atrioventricular node (i.e. it has a negative dromotropic effect). So its administration is indicated for atrial fibrillation and atrial flutter with rapid ventricular response. By slowing down the conduction in the atrio-ventricular node and increasing its refractory period, digoxin can reduce the ventricular rate. Even though arrhythmia itself is not affected, an improvement of the pumping function of the heart is shown due to improved filling. Nowadays treatment with digoxin in cardiac patients is controversial and has been often replaced by other drug therapies; then digoxin is no longer the first choice for congestive heart failure, but can still be useful in patients who remain symptomatic despite proper diuretic and ACE inhibitor treatment. Recently digoxin has received negative opinions by the medical community because it did not demonstrate a mortality benefit in patients with congestive heart failure (on the other hand, it did demonstrate a reduction in hospitalizations for this condition). Because other therapies have shown a mortality benefit in congestive heart failure, maximizing other therapies (i.e. beta blockers) first is recommended before introducing a digoxin therapy. As shown in a recent study (Digoxin and ouabain induce the efflux of cholesterol via liver X receptor signalling and the synthesis of ATP in cardiomyocytes, 2012), in human hepatoma cells digoxin and ouabain can increase the rate of the mevalonate cascade; moreover, there are also Na+/K+ ATPase-independent effects: they increase the expression and activity of 3-hydroxy-3 methylglutaryl-CoA reductase and the synthesis of cholesterol in cardiomyocytes. Against all odds, this does not provoke intracellular cholesterol accumulation. Infact, the effect of glycosides is the activation the liver X receptor transcription factor and an increase in the expression of ATP-binding cassette protein A1 transporter, through which cholesterol leaves the cells is delivered to apolipoprotein A-I. Digoxin and ouabain also enhance the rate of electron transport in the mitochondrial respiratory chain and the synthesis of ATP: infact they increase the synthesis of ubiquinone (another derivative of the mevalonate chain of reactions). From this study was deduced that cardioactive glycosides may show a role in the reverse transport of cholesterol and in the energy metabolism of cardiomyocytes. Other studies (Digoxin and ouabain induce P-glycoprotein by activating calmodulin kinase II and hypoxia-inducible factor-1@a in human colon cancer cells showed how cardioactive glycosides can induce, 2009) P-glycoprotein (which is a transmembrane transporter extruding several drugs) through a mechanism not known yet. This means that a therapy with digoxin can induce resistance to chemiotherapy. As seen before, the inhibition of Na+/K+ ATPase by glycosides causes an increased concentration of intracellular Na+, which determinates an increased activity by the Na+/Ca++ exchanger; this leads to an increased Ca++ concentration. Ca++ promotes the activity of calmodulin kinase II enzyme, which activates the transcription factor hypoxia-inducible factor-1alpha. HIF 1alpha causes the increased expression of Pgp, which leads to extrusion of chemioterapic drugs. This effect can be avoided by inhibiting Na+/Ca++ exchanger or calmodulin kinase II. On the other hand, some studies (Anticancer activity of cardiac glycosides, 2012) support the thesis that cardiac glycosides prolong the survival of carcinoma patients treated with conventional chemotherapy, by influencing the immune response at multiple levels. In addition, recent results suggest that cardiac glycosides trigger the immunogenic demise of cancer cells, which most likely contributes to their clinical anticancer activity. As it was said previously, digoxin can be toxic and, in some cases, fatal. Its therapeutic plasma concentration range is 0.5 - 1.5 ng/ml and it has a relatively narrow therapeutic safety window. Plasma concentrations above 2.0 ng/ml can lead to digitalis toxicity, which is manifested as arrhythmias (especially atrial tachycardias, even life-threatening) and atrioventricular block. If toxicity occurs with digoxin, it may take several days for the plasma concentrations to fall to safe levels because of the long half-life; in extreme cases an immune Fab (*Digibind*) can be given to the patient in order to rapidly reduce plasma digoxin levels. Potassium supplementation can also reverse the toxic effects of digoxin if the toxicity is related to hypokalemia.